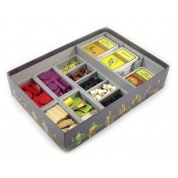 Note: Insert designed for games with external box dimensions of 29.5 x 29.5 x 7.1 cm. Also note that this is the second version of insert for Terraforming Mars. With the top layer removed there is the second layer of trays underneath. 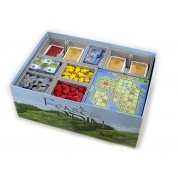 There is also a third square tray for the ocean tiles in the top right corner underneath the tray shown with the white cubes. Of the two large vertical trays, one is for project cards, and one is for the Prelude cards and the Colony tiles. The two narrow vertical trays are for the reference cards and the corporations. The three horizontal trays are for project cards. There is space for all cards to be sleeved with quality sleeves. 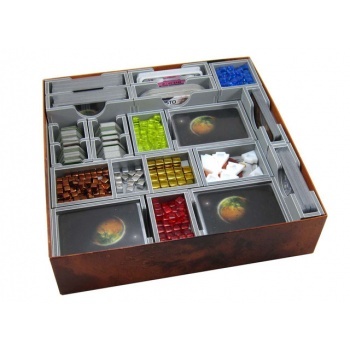 All the trays can be used during the game to organise the components and make access by all players easy. The game boards and rule books go on top of the central trays and act as a lid keeping the game pieces in the trays. The lid closes flush, and the box can be stored vertically. When placing them inside, first go the two game boards, followed by the Venus and Colonies side boards. Next go the player boards, and then the expansion rule books. 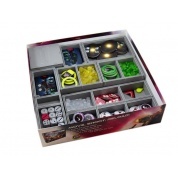 Lastly the game rules go on top, filling the box.